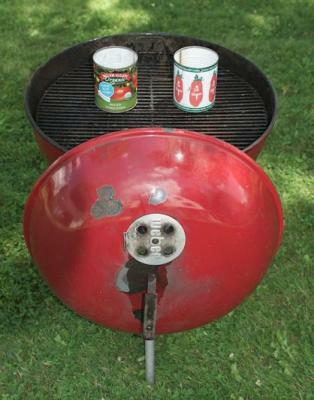 See the attached pdf file for printable Char-B-Que Instructions in Gorgeous Full Color Detail! want to have in your design. Use that result as the distance between hole centers. Mark the hole centers as per the above and then make your holes. form factor, and fuel size. Perfect Char-B-Que Chicken. Juicy. Tender. No smokey taste. And no burned bits at all.Skin was also very crispy. Cooking time: about 45 minutes. The right iCan had more primary air holes, 21, and burned out at 40 minutes. The left iCan was complete at 48 minutes. It had only 15 holes for primary air. Tuning is important. Biochar from the wood pellets in the iCan TLUDs at the end of the Char-B-Que. The biochar, which will be mixed with compost and then added to gardens as a soil amendment is how carbon that was in the wood pellets is sequestered. The long term sequestering of the carbon from the biomass is what makes the Char-B-Que "Carbon Negative".